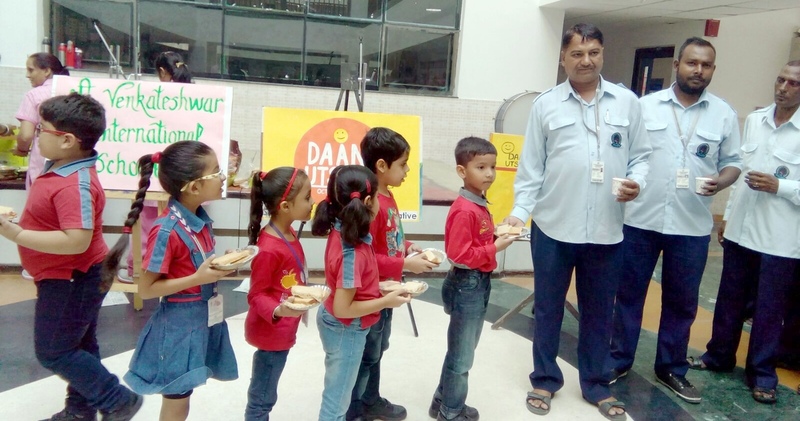 Young kids of Classes 1-3 participated in the Daan Utsav , a week long programme. Parents and teachers participated with as much enthusiasm. It was a treat to see young children, wearing gloves, making sandwiches with cucumber slices, butter, jam and milkmade. Sandwiches were made in bulk by about 500 students under the guidance of mentors and were neatly packed in cartons lined, with foil. Tea campers with disposable glasses were procured from the pantry and armed with good wishes and some banners proclaiming, ‘Heart that gives, finds Joy’ boarded school buses to bring a ray of smile in the life of labourers, rickshaw pullers, and support staff in school and community. 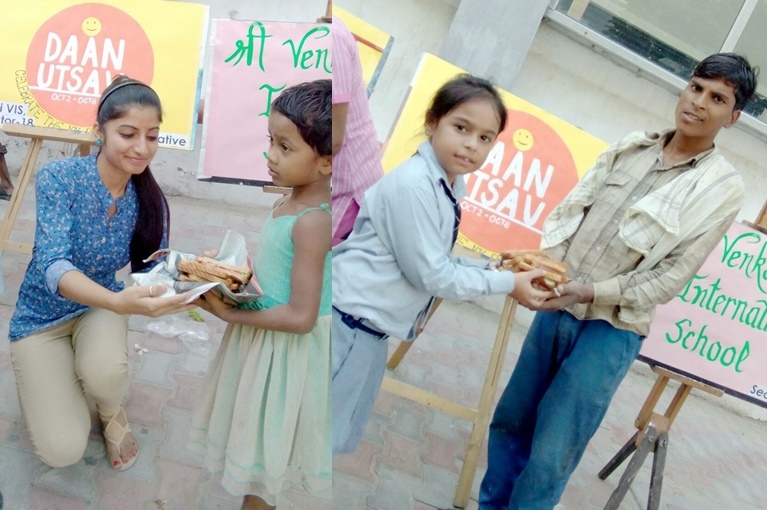 People at Sector 12,14, 21 Metro stations and some construction site workers blessed the young angels, who learnt the lesson of sharing and caring.The activity will go on from time to time as a regular feature. School Social Responsibility and Eco Departments under the guidance of Chairman Sh Sailander Solanki, Directors SSR Mr Rishabh and Mr Ankur, Principal Mrs Nita Arora, Jr Wing Headmistress Mrs Shama Kapoor, Eco Club Incharge Ms Bhawna Sharma and the Administrative Officer Mr Sanjeev Chauhan and teachers are sensitizing the children towards the joys of noble deeds.